We splashed last Friday morning, and are ecstatic to be back in the water. Lower temperatures, no ladders off and on the boat, and we can use the sink and head again. Even Minion seems more content, although after Jenn noticed he seems to be a bit pudgy and plans to cut his food ration, we’ll see how happy he remains. After our launch we’ve continued boat project mode. Our progress was interrupted by the several hours it took me to figure out the battery monitor had gone wonky because a couple fuses blew (not sure why but the problem hasn’t reoccurred). After disconcerting shore power and the solar charger and still showing 200-300 amps coming into our system (normal is maximum of about 20 amps) according the the batter monitor I figured I either stumbled on some kind of perpetual energy or we were getting a seriously erroneous reading. Sadly, it was the latter, and after checking all the connections and checking the actual battery voltage I finally found a couple blown fuses that were causing the problems. Once solved, we moved on to solving some other electrical issues, namely not having a compass light and power for autopilot I’m going to attempt to install. We knew all along we didn’t have a compass light. There was a bulb there, but no power to it, and none of the switches on the electrical panel seemed to turn it on. I found a random wire in underneath the cockpit with nothing hooked up to it that was connected to one of the switches, so I hooked it up to the light. But something was amiss with this wire, and it would blow fuses or dim the whole panel when turned on. 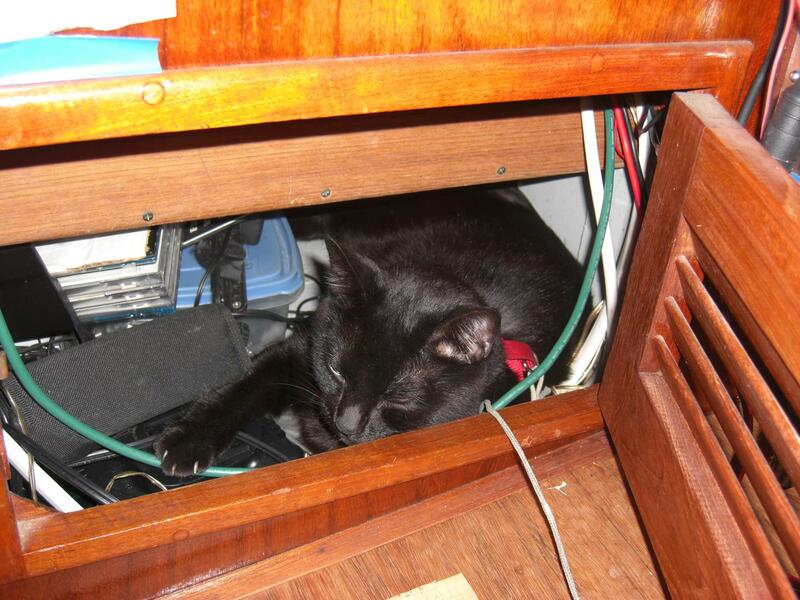 Pus, it was speaker wire. So… it was time to run a couple new wires to the cockpit, one for the compass light and one for the autopilot. As simple as this sounds it took about a day of work to get these two lines run and hooked up to breakers in the electrical panel. All this had to be moved. Out of “storage” and back in. Minion actually found a place to be out of the way. For once. 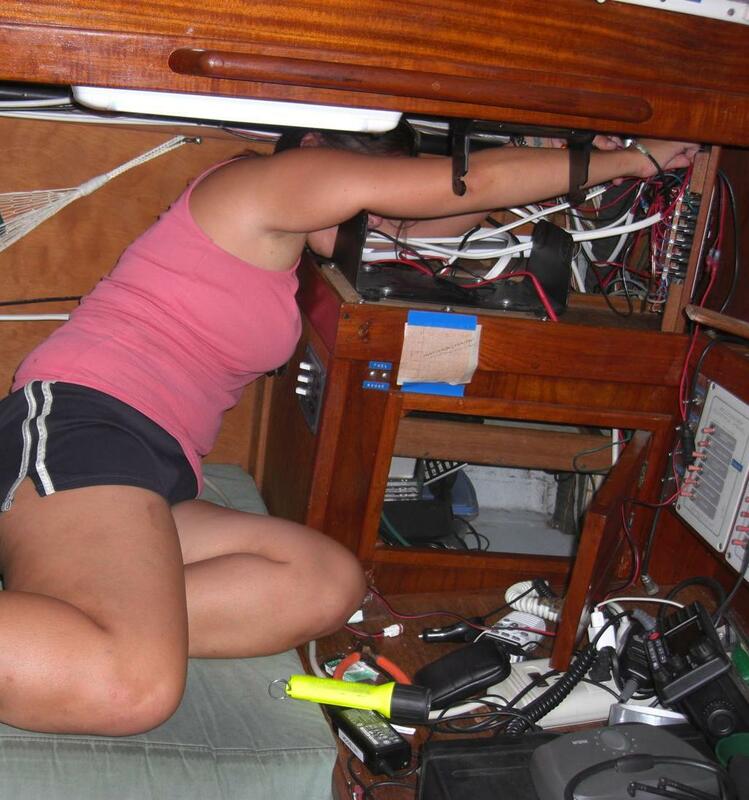 Jenn works on hooking up some wires after I crawled in the bowels of the boat running them. 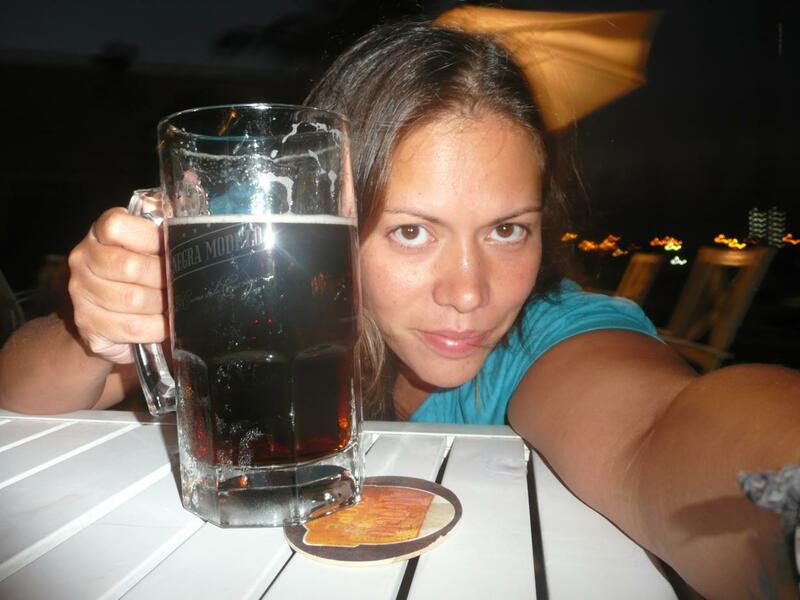 All that work made us very thirsty, and a mug of Chope bigger than your head solved the thirst problem. 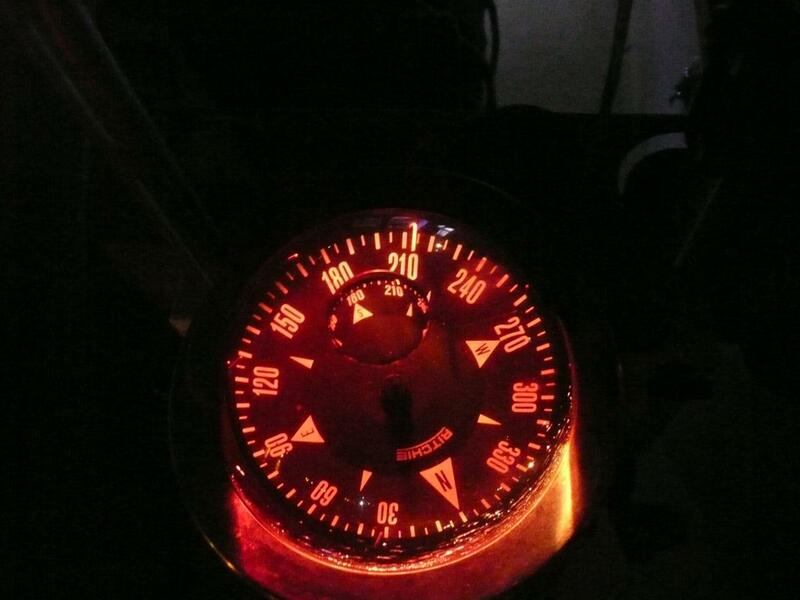 All that work for a compass that lights up at night. We had been using a 9 volt battery and LED light someone left at one of our super bowl parties years ago to light up the compass, all taped up the pedestal. It was not the ideal solution, especially esthetically. And we refilled the compass with fluid to remove a large bubble, although a small one had reappeared for reasons unknown. Further investigation is required, but will occur later. Since the boat seems to be keeping water out after our haulout and work, we are ready to head to La Paz and should be leaving in the next couple days if the weather works out for us. I finally have batteries for the Spot you can track our progress. I’ll get some final boat yard pictures and opinions up soon, but we are happy with our experience. This entry was posted in Boat Projects, Mexico and tagged Chope, compass light, electtrical work, Minion, wiring by Erlin. Bookmark the permalink. 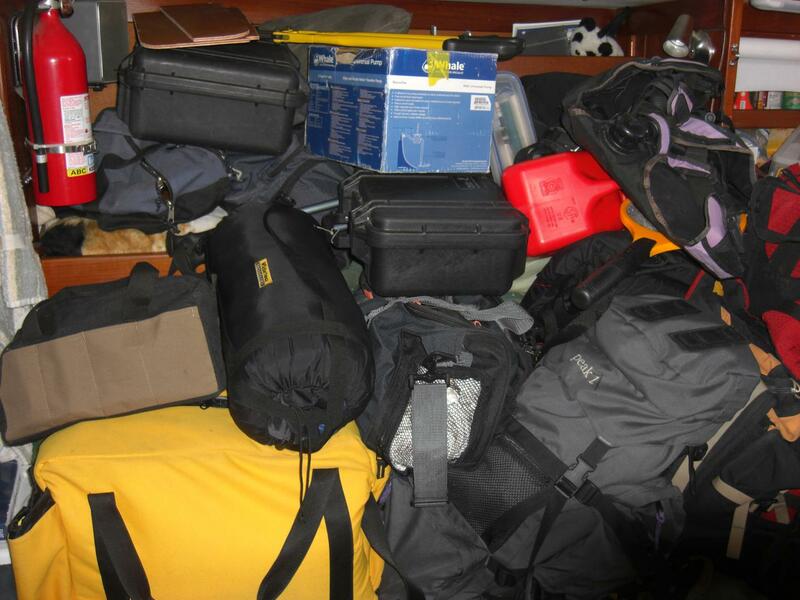 Where did all that stuff come from, wow your boat must have grown to fit it all. Nice light and glad all the underwater fittings are working as they should… keeping water out!